How do you know what size envelope is right for your piece of paper? The following diagrams illustrate some common envelope sizes in comparison with the size of a sheet of A4 paper. This is a C4 (324x229mm) size envelope, one of the most common envelopes. It can hold a sheet of unfolded A4 paper. This is a C5 (229x162mm) size envelope. It can hold a piece of A4 paper folded in half once or a piece of unfolded A5. 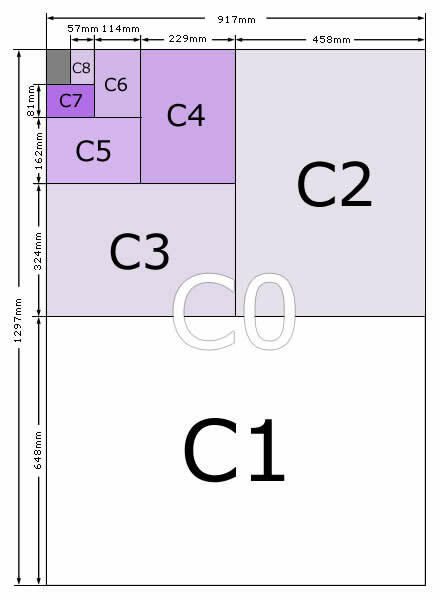 This is a C6 (114x162mm) size envelope. It can hold a piece of A4 paper folded into quarters, an A5 piece of paper folded in half once or a piece of unfolded A6. This is a DL (110x220mm) size envelope.it can hold a A4 piece of paper folded into thirds or an A5 piece of paper folded once, this style of envelope is most commonly used in buisness. Note: Centimetres (cm) values can be obtained by dividing millimetres by 10 and metres (m) by dividing millimetres by 100. Dimensions in feet can be obtained by dividing inches by 12. The C6/C5 envelope size was introduced as a replacement for the DL envelope (mainly to allow a little more tolerance for automatic enveloping machines), however it has never really caught on and most DL style envelopes still measure 110x220 mm.